There is an app I use a lot for fine tuning my images, Camera+. I like the ‘Scenes’ options that allow the tune the lighting of an image. Effects is the app’s way of saying ‘Filters’ which work well. 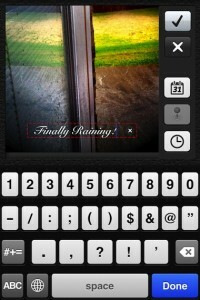 A little known feature of Camera+ is the ability to add text to images. It is hidden a bit so it’s easy to miss or even forget when you know about it. When viewing a image to edit, choose the ‘Borders’ option, then when you choose a ‘Frame’ you will find a ‘Captions’ button. With this feature, you can add free form text, edit location and add date or time.